Hurricanes, fires, our world. I am feeling the pains of our earth. We all need to do something. If not, destruction will happen. Hurricanes in the East Coast and fires in the West Coast. Our God is not happy right now. And our change in the climate is stuck in the middle. Instead of fighting each other about race let's gather together to save our planet. Philly Thrive is a grassroots organization of Philadelphians taking action for clean air, climate justice, and the right to breathe. We’re defending our communities and our future against the largest fossil fuel refinery on the East Coast. We oppose Philadelphia becoming a toxic fossil fuel “energy hub” - we need a transition to an economy that serves people and planet. We envision a just transition to climate jobs, clean energy, and healthy communities. Read below to learn about our internship opportunities. With the Democratic Primary on Tuesday May 16, District Attorney Candidate Larry Krasner reached out to Philly Thrive to win the support of our membership. Krasner has been the only candidate to speak about the importance of prosecuting lawbreaking polluters. In the past year, Philly Thrive has striven for environmental success. Everyone had worked together in live actions, demonstrations and meetings against the oil refinery and at the Philadelphia Regional Port Authority. On Tuesday, October 26, Philly Thrive held its monthly Movement Assembly. About 25 people came to hear about what action circles had been up to in the past month. Philly Thrive is hiring a part-time Fundraising Coordinator to help raise our campaign to the next level. 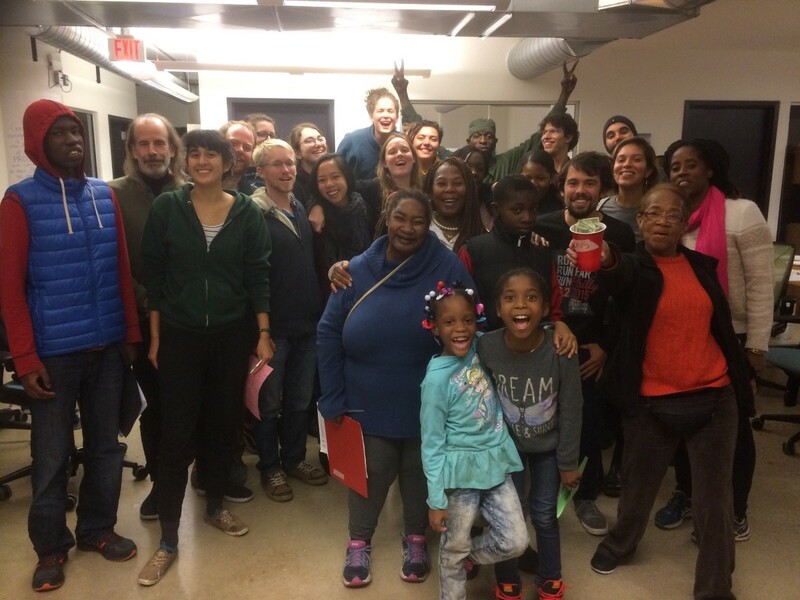 Philly Thrive is an emerging community organization committed to building a multi-racial, cross-class movement for environmental justice across Philadelphia. Our Right to Breathe campaign is shifting public support against toxic fossil fuel projects in the city, focused on the largest oil refinery on the east coast located in South Philly. We build power through neighborhood organizing and creative direct actions to achieve our three goals: health and safety over profit, no fossil fuel expansion, and a green economy for all. The fundraising coordinator will be a part-time position (25 hrs/wk) responsible for expanding Philly Thrive’s fundraising team and overseeing our overall fundraising strategy. On Saturday, September 17, over 400 Philadelphians gathered at City Hall in a show of solidarity with the Standing Rock Sioux tribe of North Dakota. The protesters, holding signs echoing Standing Rock’s rallying cry of “You Can’t Drink Oil” and “Water is Life,” snaked through Center City in an epic display of grassroots mobilization. The Standing Rock Sioux has captured the world’s attention in its display against corporate environmental injustices. As Transfer Energy Partner’s Dakota Access pipeline threatens to unearth the tribe’s sacred lands and pollute the Missouri River, over six thousand members of supporting tribes have gathered in North Dakota to protest the pipeline’s construction. It is the largest gathering of Native Americans in over one hundred and sixty years and calls attention to the silent expansion of fossil fuel infrastructure in the backyards of the disenfranchised. Zalaka Thompson and Irene Quinn are two members of Philly Thrive who chose to participate in the Standing Rock Solidarity March and a parallel action at a Center City TD Bank location. Both women and their families have faced the negative effects of Philadelphia Energy Solutions’ oil and gas refinery in South Philadelphia. They both took important roles in the action on Saturday, showing at once that Philadelphians stand for the struggle of the Standing Rock tribe and that they deserve the Right to Breathe in their own homes and communities. On July 26th, in the midst of the DNC, frontline leaders from Philly and around the world hosted a “Toxic Tour” of Philadelphia Energy Solution’s oil refinery and the toxic, extractive economy it embodies. PhillyThrive stood alongside Action United, LeftRoots, and Global Grassroots Justice Alliance, who organized the It Takes Roots Caravan that started at the RNC in Cleveland and ended at the DNC in Philly. The group mobilised after inviting Governor Wolf to the tour. When he didn’t show up, we knew we’d have to continue the fight that is always led by the people.